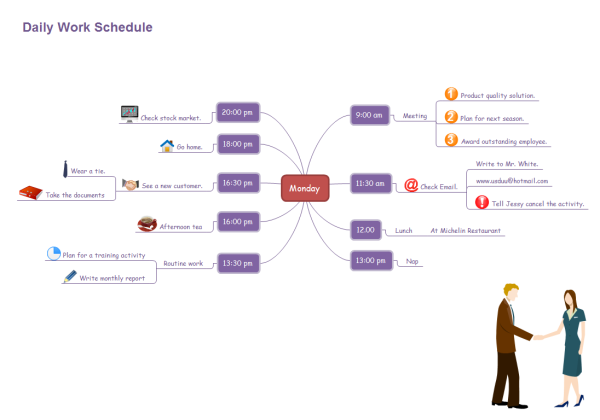 A simple brainstorming diagram example shows one's daily work schedule created with Edraw brainstorming software. Based on this template, users can easily create their own daily work schedules. By using this brainstorming diagram template and massive Edraw built-in symbols, one can create great daily work schedule in a short time. Download and modify this template for your own use. Discover why Edraw is an excellent program to create daily work schedule brainstorming. Try Edraw FREE. 1.1.2 Plan for next season. 2.1.1 Write to Mr. White. 2.1.3 Tell Jessy cancel the activity. 7.1 See a new customer.